So you’re interested in cloth nappies or maybe you’ve already bought them. Now what? Once your baby has done their business in their nappy what then? How do you store it until it’s time to wash and dry the nappies ready to go back on baby’s bum? Read on for a full breakdown of what you need to do. What do I do with a wet nappy? It is not necessary to do anything to your wet nappies when you take it off your baby. There is really no need to rinse them out before storing them ready for wash day. I would, however, recommend that you remove any inserts from your nappies so that they are totally ready for washing. While your hands are already dirty from the bum, change now is the time to dismantle your nappy. This means that when it is time to wash your nappies you don’t have to sift through them before popping them in the machine. Now is also the time to stick down any velcro tabs so that they don’t stick to the fabric of your other nappies in the wash and ruin and the material. What do I do with a poopy nappy? Breastfed baby poop is all water-soluble, so it is not strictly necessary to rinse it before storing the nappy ready for wash day. When it comes to poop from a baby that is bottle-fed or has started solid food, you will need to flush the poo from the nappy down the toilet before storing it. This is where liners come in handy. As I discussed in my post or about liners, inserts and boosters, you do have the option to use a completely flushable liner. I use reusable liners and simply flush the poop. The easiest way to do this is to hold one end of the liner into the toilet and flush. This is called “slooshing” in class cloth nappy circles. Another option, if your showerhead will reach as far as the toilet, is to use the shower to rinse the poop into the tablet. This can be especially handy for stubborn and sticky poo. 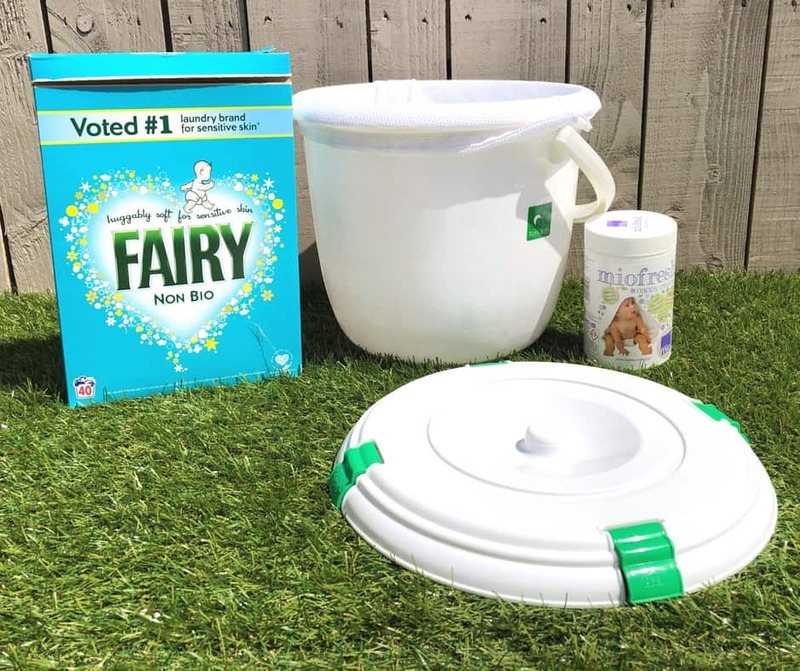 How do I store the dirty nappies ready for washing? 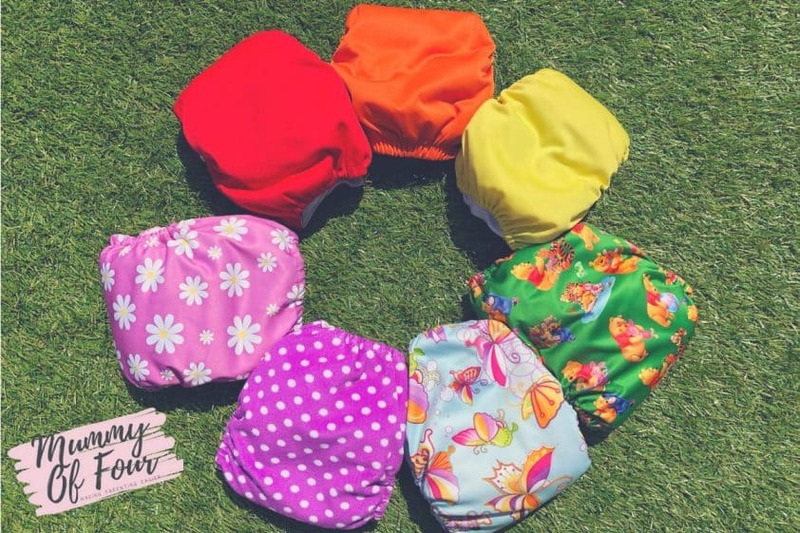 As I discussed in my cloth nappy accessories post, options the storing your nappies before washing them are basically bag or a bucket. 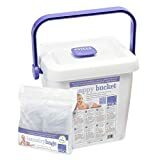 Nappy buckets are a great option for storing in your dirty nappies while in the house. 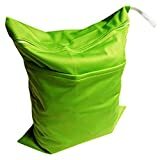 The easiest way to do it is to use a mesh laundry bag. 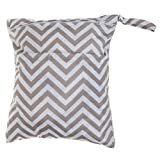 Simply pop the mesh laundry bag into the bucket and sling in your nappies in as you take them off your babies bottom. 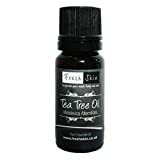 It can be a good idea to add a couple of drops of tea tree essential oil to mask any nasty smell. 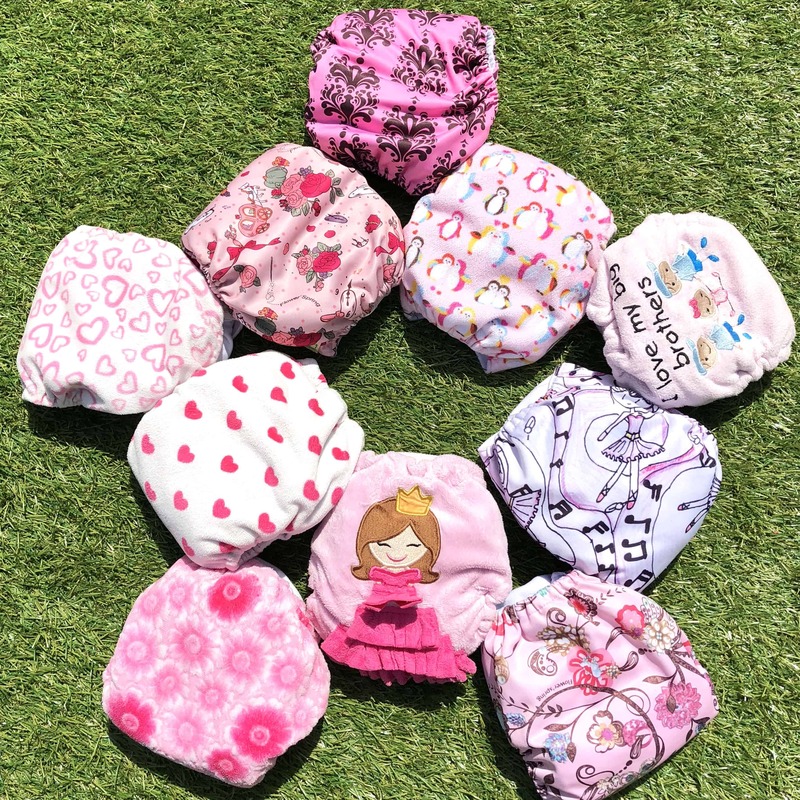 Don’t forget to take any inserts out of your nappies before popping them in the bucket so that you don’t have to sort through them when it comes time to stick them in the machine. 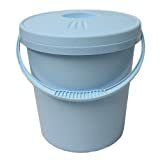 There is really no need to soak your nappies when they are in the bucket, dry pailing works best for me. 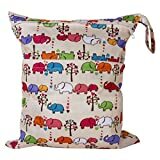 Wet bags are an easy and portable option to store new dirty nappies. 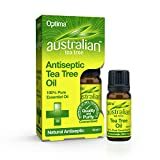 Quite simply sling your nappies into the bag along the couple drops of tea tree essential oil and zip it up ready for wash time. For out in about, I use smaller versions of the wet bags with a couple of drops of tea tree oil in them. I always make sure I have a few extra wet bags with me for other mucky baby things such as bibs and soiled clothes. How do I wash my nappies? If you are using a bucket and mesh, then quite simply remove the entire mesh from the bucket and tip the mesh and all of it’s contents into your machine. 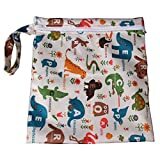 If you are using a wet bag, simply and that the bag and turn it through emptying nappies into the machine and sticking the bag in with it. It is important to follow the manufacturers instructions when washing your nappies. Personally, all of mine go in on a pre-rinse then a long 60° wash. The important thing is to ensure that machine is not overstuffed to give the nappies plenty of opportunities to move around and get cleaned. Make sure that there is plenty of water to rinse out any do and the additional washing powder. If your washing machine is anything like mine it will have a baby or a bedding machine setting that should be suitable. I use Fairy Non-Bio washing powder and a scoop of MioFresh. I’m sure other brands would work just as well but personally, I found that these work for me as my children have sensitive skin. What is important is that you choose a powder rather than gel to avoid clogging your nappies. And most important of all avoid fabric softener at all costs. Fabric softener will ruin the absorbancy of your nappies. A popular way to dry nappies is to line dry them. This is obviously the most environmentally friendly method of drying, plus offers the benefit of sun bleaching any stains out of your nappies. Here in the UK, the weather is so random and unpredictable but I don’t find this method very useful for my busy lifestyle, as the second I would peg out any nappies, it would surely rain. I tumble dry my nappies. While this is not the most environmentally friendly or economical option, it certainly is easiest. Make sure you avoid tumble drying any nappy wraps which would be ruined with the heat. Also, make sure your dryer is on low to avoid melting in the waterproof lining of any nappies. 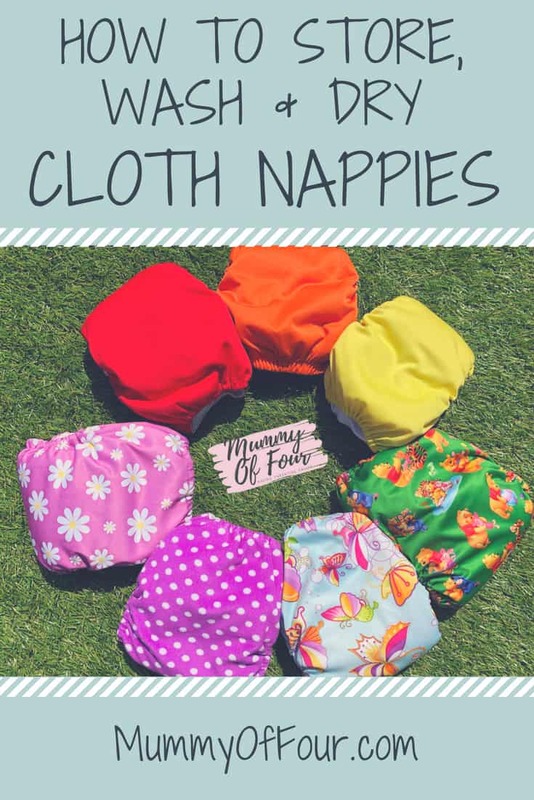 Next, read about cloth wipes and why they make an awesome addition to your cloth nappy routine.